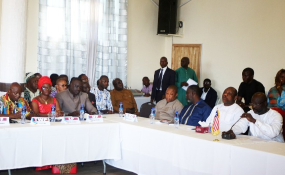 On Thursday, August 8, 2018, President George Weah had a sit down with 26 political parties of Liberia. The meeting aimed at advancing ideals that promote the spirit of national unity and political tolerance between opposition political parties and the government. ANC, LP and UP attended the meeting as a team. According to Deputy Minister Eugene L. Fahngon, Deputy Minister for Press and Public Affairs at Ministry of Information, Cultural Affairs & Tourism, all 26 political parties attended and participated from start to finish. Even though, social media was buzzing about AB Dillion walking out of the meeting, he walked out as an individual and not a political party, "the invitation was extended to political parties and not to individuals," Minister Fahngon stated in his live video. Each political party gave ideals and recommendations, which made the meeting a great success. According to Deputy Minister Fahngon, "there will be future engagements as such."